This section will explain two interrelated subjects. It is imperative for you to read about both of these topics to have a complete understanding of your condition. Your increased knowledge could prevent serious, undesirable consequences. The dictionary defines dystrophy as any condition caused by a nutritional deficiency. The term, dystrophy, is no longer used in this manner. It is now used to denote a congenital (inborn) metabolic abnormality of a body structure. In this particular dystrophy, the defect involves the cornea of the eye. The cornea is the clear ‘window’ at the front of the eye. 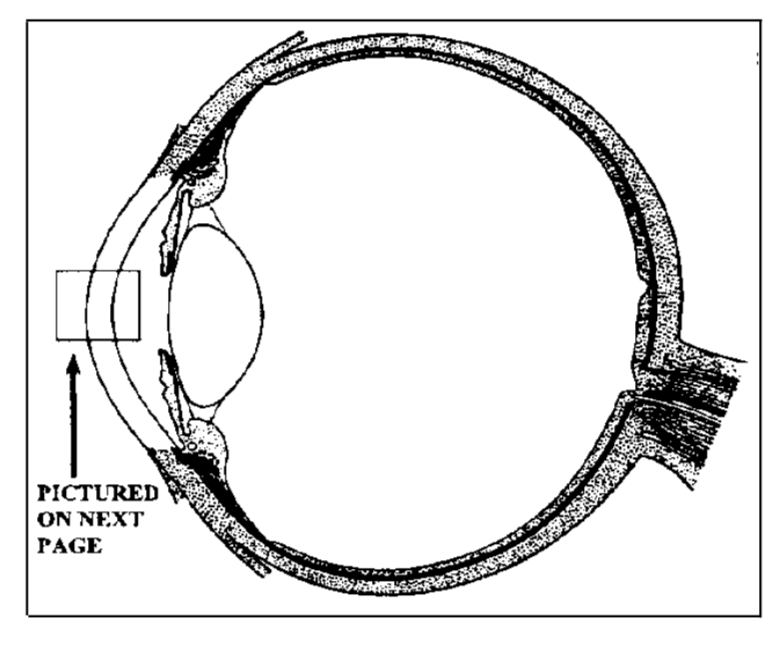 In the case of map-dot-fingerprint dystrophy, the abnormal part of the cornea is the basement membrane. As you can see from the drawings, the basement membrane is an extremely thin structure underlying the epithelium of the cornea. Despite the small size of this membrane, its job is essential. It is this membrane that is responsible for bonding the epithelium to the underlying stroma. With map-dot-fingerprint dystrophy, the basement membrane of the cornea becomes badly disarranged. The reason why this occurs is not known. It is this irregularity that gives this dystrophy its characteristic appearance. When viewed with a microscope, the areas of abnormal basement membrane can appear as ‘dots’ when only a small area of the cornea is involved. When a large part of the cornea is affected, the abnormality can look like a fingerprint. 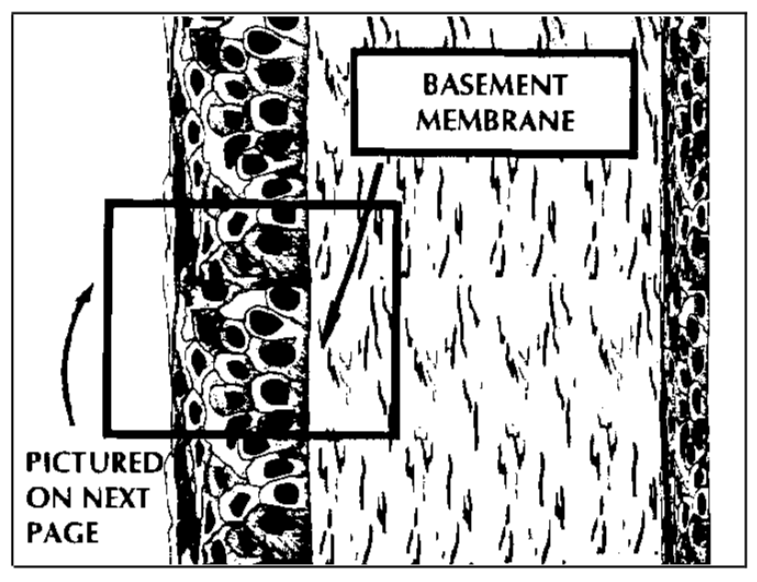 When an even more substantial portion of the basement membrane is disturbed, the irregularity can resemble a map. As a result of this disarrangement, the corneal epithelium ceases to be appropriately bonded to the underlying corneal stroma. When this occurs, sheets of epithelium can become loose and can, therefore, leave areas of exposed basement membrane and stroma. This situation is identical to a corneal abrasion. When a person strikes their eye with a fingernail or a piece of paper, sheets of epithelium are knocked off of the cornea causing a corneal abrasion. Therefore, map-dot-fingerprint dystrophy can cause a corneal abrasion to occur. The most important feature of this abnormality is that this abrasion can occur spontaneously without a history of a physical injury to the eye. Map-dot-fingerprint dystrophy can lead to recurrent erosion syndrome. Because the epithelium is loose, spontaneous abrasions (or erosions) can occur. Characteristically, these erosions happen when the eye is drier than usual. Thus, the most common time for a recurrent erosion to occur is upon awakening in the morning. While a person sleeps, tearing is decreased, and mild corneal edema is present, disrupting the complex structure of the epithelial cells. If there is a small area of loose corneal epithelium, and, if that small area becomes slightly stuck to the underside of the upper eyelid during sleep, an erosion can result from that small area being torn from the underlying stroma as the person first opens the eyes. Many patients who are afflicted with this condition will notice minor irritation upon awakening. The affected individual may experience resolution of the symptoms within the first hour or two after awakening because a little erosion can resolve reasonably quickly. Most patients develop the recurrent erosion syndrome after minor trauma to the eye results in an incompletely healed cornea. Others, who have not ever traumatized their eyes, can spontaneously start having erosions. Usually, these spontaneous erosions occur in the fourth to sixth decade of life. The underlying dystrophic condition is not treatable at this time. Therefore, physicians aim treatment at re-establishing a noneroded surface epithelium. With the first occurrence of erosion, simple patching with an antibiotic ointment will frequently resolve the issue. Patching does not fix the dystrophy. It can, in many instances, however, control the patient’s problems. When simple patching is not sufficient, NaCl (Sodium chloride – or, table salt) drops and ointment can be quite effective. NaCl preparations have the effect of dehydrating and lubricating the cornea. The dehydration of the cornea tends to reduce the edema and make the epithelium ‘stick’ to the stroma. The lubrication tends to keep the epithelium from sticking to the underside of the upper eyelid. A patient uses drops during the waking hours for a one or two week period and the ointment at bedtime for a minimum of six months. When a corneal erosion is significant or when sheets of loose epithelium are present or when a small erosion does not respond to the above treatment, corneal debridement can be a straightforward and painless solution. The eye is anesthetized with a couple of drops of topical anesthetic (no shots are needed). Then, with a cotton-tipped applicator, the areas of loose epithelium are gently wiped off. 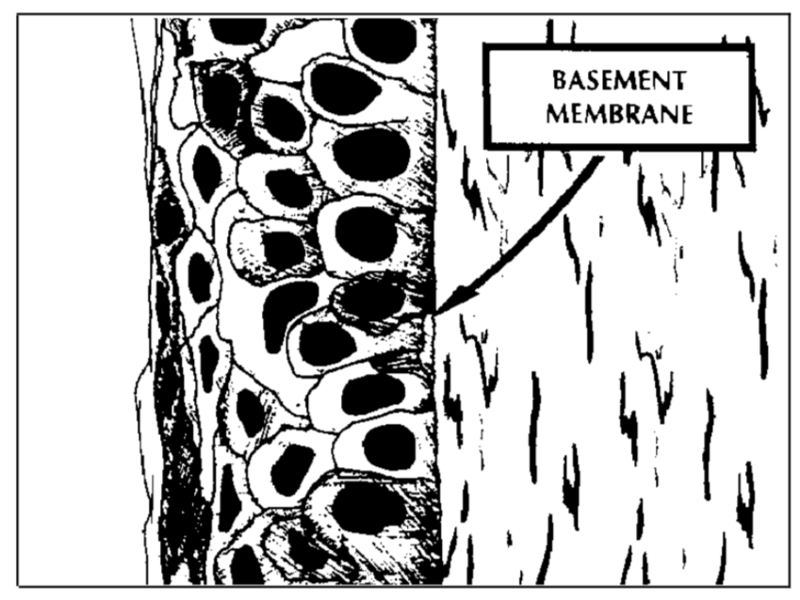 The abnormal basement membrane comes off with the epithelium, leaving a naked stroma. This method allows the eye to heal itself by laying down new epithelium and a new basement membrane. This procedure can frequently alleviate recurrent erosion symptoms for years. After a corneal debridement, the patient wears a patch until the resulting abrasion resolves. When none of the above treatments work, a patient can apply a bandage contact lens to the eye. These soft lenses protect the damaged or abnormal areas of the cornea from the upper eyelid. These bandage contact lenses are fitted and worn just as is any other contact lens. Bandage contact lenses have gained in popularity, and physicians now frequently employ them as one of the initial treatments. If a recurrent erosion patient has dry eye syndrome, occluding the drainage channels can increase the available tears and help in the treatment of the erosion syndrome. In some cases, this is all the treatment that is needed. Surgery for this condition is in its infancy. Researchers have not come to any consensus as to the type of procedure physicians should perform or even which patients need surgery. It is rare for a physician to recommend surgery for the treatment of recurrent erosion syndrome.